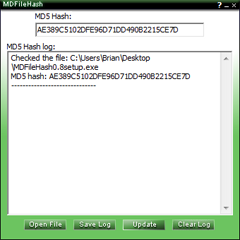 MDFileHash is a simple piece of software allowing you to drag and drop your files to MDFileHash, revealing the MD5 hash value for a specific file. This allows you to see whether a file is legit or has been tampered with. Additionally you can save the log of all the files you have opened with MDFileHash. MDFileHash has an update button that allows you to check for updates and update, without the hassle of having to download and re-install. The bigger the file, the longer the processing time - as MDFileHash is not yet programmed to divide the processing of the data, the program will look like it is crashing. However, give it time and it will eventually tell you the signature of the file. Missing progress bar to track how much of the file has been processed. No updates for MDFileHash yet! 2. Right-click in the bottom-left corner and choose the Programs and Features from the menu. 3. Select MDFileHash and then click Uninstall. 2. Right-click in the bottom-left corner and choose the Control Panel from the menu. 3. Click Uninstall a Program. 4. Select MDFileHash and then click Uninstall. IMPORTANT-READ CAREFULLY: This End-User License Agreement ("EULA") is a legal agreement between you (either an individual or a single entity) and DesktopNerds.com. SOFTWARE(s) identified above, which includes the User's Guide, any associated SOFTWARE components, any media, any printed materials other than the User's Guide, and any "online" or electronic documentation ("SOFTWARE"). By installing, copying, or otherwise using the SOFTWARE, you agree to be bound by the terms of this EULA. If you do not agree to the terms of this EULA, do not install or use the SOFTWARE. You may use the SOFTWARE without charge. We may place announcement of other products into SOFTWARE. DesktopNerds.com will not monitor the content of your use (e.g., sites selected or files used). You may make copies of the SOFTWARE as you wish; give exact copies of the original SOFTWARE to anyone; and distribute the SOFTWARE in its unmodified form via electronic means. You may not charge any fees for the copy or use of the SOFTWARE itself. You must not represent in any way that you are selling the SOFTWARE itself. Your distribution of the SOFTWARE will not entitle you to any compensation from DesktopNerds.com. You must distribute a copy of this EULA with any copy of the SOFTWARE and anyone to whom you distribute the SOFTWARE is subject to this EULA. 3.1 You may not reverse engineer, de-compile, or disassemble the SOFTWARE.